In 2009 in-season testing was effectively banned in Formula 1. The ban was brought about due to rising costs, the increasing number of races on the calendar and as an effective equalisation element on the teams. Before 2009 those who could afford to would test their cars on any FIA approved track for however much they liked. Ferrari F1 cars would spend day after day pounding round their own test track in Fiorino and most of the F1 teams would regularly turn up to test sessions at Silverstone, Magny Cours, Jerez, Estoril and Barcelona. Aside from Ferrari owning their own track, teams would sometimes hire a track, such as Paul Ricard or the old Valencia circuit, to conduct private test sessions. The amount of testing undertaken by the teams meant that the larger outfits would have their own test teams with dedicated, engineers, drivers and race transporters. The race team would return to the factory on Sunday night or Monday morning just as the test teams were taking off for a three day session elsewhere to try out the latest pieces of kit in order to make the race cars go faster. It was a fantastically expensive and extravagant way to spend money but then again the top F1 teams had plenty of money to play with. In the mid-2000's Ferrari and Toyota were both operating on a budget of nearly half a billion dollars each. In 2001, the year before their debut, Toyota hired the Paul Ricard track (owned by a certain Bernie Ecclestone) for the entire year. Over the course of that year they completed 3000 laps. Elsewhere the F1 circus completed a mere 1065 race laps in 2001. Because the top teams were testing the mid-field joined in too and if they wanted to climb the ladder those at the bottom of the grid had to do their best and conduct as much testing as they could afford. The key to all this testing was development. Now, in 2013, we see a fantastic season of racing not only because of the Pirelli tyres, but because no-one really knows what their latest developments are going to do when they are bolted on the car and hit the track. There is only so much wind-tunnels and CFD can tell an engineer about how a car, and it's latest upgrades, are going to perform. Before the test ban teams were able to design a new wing and test it for 1000 miles over a three day test. Now they have to hope that what their data tells them is accurate. And often it is not accurate so an element of randomness is introduced and we get great racing. But, despite the cost, the drain on resources, the draining effect on the personnel of the smaller teams, the unfairness that those who could afford to test would ultimately perform better in races and the fact it was grossly extravagant I miss testing. Because test days gave us, the members of the public, a chance to see and hear F1 cars up close. I went to every testing session I could. I would check the Silverstone website (or phone them before websites were invented) and find out when the test sessions were taking place and who would be attending. I would then drive up to Silverstone, enter the circuit for free, park up inside the circuit and be able to wander in any place that was not restricted - which was most of the northern section of Silverstone. A typical test day could involve between three and ten teams with one or two cars each running a combination of test and regular drivers. This meant we could stand on the inside of Maggotts, along with ten or twenty others, and watch Schumacher in his Ferrari and Hakkinen in his McLaren deftly flicking their cars at 150mph through some of the most demanding corners in the world from 9am until 5pm with an hour break for lunch. We could stand inside Copse and watch Dario Franchitti trying out the Jaguar F1 car round the best first corner on any F1 track and Damon Hill in his Williams pull out of the pits and stop five metres in front of us, build the revs and conduct a simulation race start. Over and over again. We could wander round the whole of the Luffield, Brooklands, Woodcote area and watch the cars take a different line every lap, trying to find the best way to take the complex - and often fail in the process. 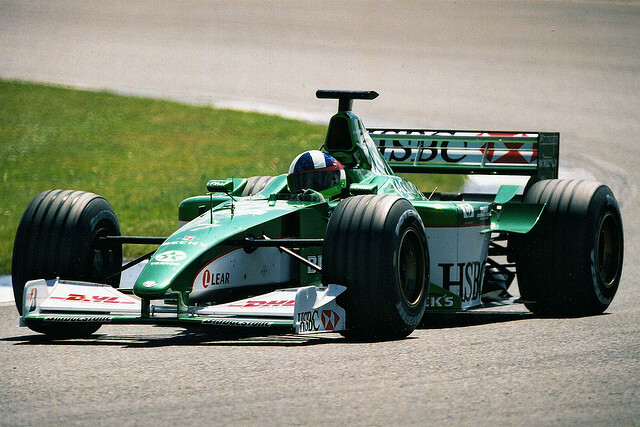 We could wander in-circuit and watch Alex Wurz in his Benetton conduct straight line testing. Up and down for two hours straight. And, best of all, we could stand on the mound inside of Abbey and watch the cars coming towards us at 180mph then stand on the brakes fifty metres before the corner. All with another two or three hundred spectators in the entire circuit. One year I was given access to the pits. I saw all the drivers, cars and garages up close with no barriers and no crowds. I saw Jenson Button, then driving for Renault, turn up in his filthy Clio V6, hop out and stroll into the Renault motorhome. I saw Gary Anderson, then Technical Director for Jordan, drive in in his V8 Jeep and remember thinking it was a very agricultural vehicle for someone with such a technical job. In short I miss F1 test sessions because they gave the fans access to everything that a race weekend doesn't. With the demise of testing what we have gained in racing we have lost in bringing F1 closer to the people who matter - the fans. And I feel for the Tifosi. Whilst I and my ilk were at Silverstone they were there, faces pressed to the fence, at Fiorino watching their beloved Ferraris pound round and round most days of most weeks. We have lost a little of the magic of F1.